JFK Murder Solved Forum • View topic - 1992 article about Joe West contact named "Hugh"
Thought this was an interesting find. 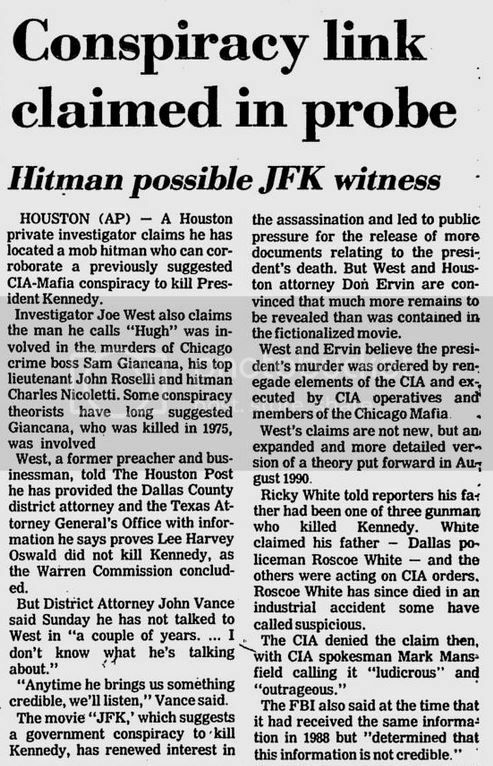 The AP ran a story about Joe West's investigation into the assassination of JFK on Feb. 17, 1992 where West cites his new source, identified only as "Hugh". This is the article that peaked the curiosity of FBI agent Zack Shelton. He contacted West, asked to gain access to this "Hugh" since Shelton had spent so much time investigating the Chicago crime scene. It was after this interview with "Hugh" that Zack told West that he had a bad lead and that "Hugh" was a conman. Zack, feeling sorry for West, revealed to him the gist of the conversation he had with an informant of his in the late 1980s when he stated that James Files told him that people wouldn't be able to handle the truth of what happened in Dealey Plaza as they drove through it. He gave West the lead on Files and the rest, as they say, is history.